The Small Publishers Fair is an annual fair for artists, poets, writers and book designers, held in Bloomsbury, London on the second week of November, with over 60 participants. Peter Foolen Editions will be present, as are Coracle, Moschatel Press, Weproductions, Boekie Woekie, John Dilnot, Longbarrow Press, New Arcadian Press, Occasional Papers, Uniformbooks and many more publishers. This year there are some very interesting new participants. 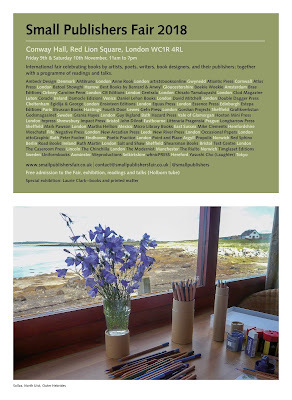 The annual exhibition in the vitrines will be Laurie Clark – Books & Printed Matter, showcasing her own drawings which are published by Moschatel Press and also illustrations she has made for Ian Hamilton Finlay, Coracle, Corbel Stone Press, Morning Star, Peter Foolen Editions, WAX 366 and others. The invitation card shows a photograph of her drawing studio during a residency in North Uist, with a vase of harebells, one of her motives. Peter Foolen Editions will present this year, among other publications and editions, a new book Weston, a necessary dream, published on the occasion of the 90th Birthday of the renowned Yorkshire collector Ronnie Duncan, and recent Proposal Books by Peter Liversidge.